Very rude to deal with. I needed an old ring remodelled and was recommended The Village Goldsmith. They did an amazing job. The ring is beautiful. Jolene was wonderful, communicating with me as needed. Thank-you! Do not use this place for IPL treatments!! Never felt so violated in my life!!! No customer service skills, what so ever!! Complete lack of professionalism and curtesy! Avoid at all cost!! Wellington (/ˈwɛlɪŋtən/) is the capital city and second most populous urban area of New Zealand, with 393,600 residents. It is located at the south-western tip of the North Island, between Cook Strait and the Rimutaka Range. It is the major population centre of the southern North Island, and is the administrative centre of the Wellington Region, which also includes the Kapiti Coast and Wairarapa. Wellington is the world's southernmost capital city of a sovereign state. Tourism is a major contributor to the economy, injecting approximately NZ$1.3 billion into the region annually and accounting for 9% of total FTE employment. The city is consistently named as New Zealanders’ favourite destination in the quarterly FlyBuys Colmar Brunton Mood of the Traveller survey and it was fourth in Lonely Planet Best in Travel 2011’s Top 10 Cities to Visit in 2011. New Zealanders make up the largest visitor market, with 3.6 million visits each year. New Zealand visitors spend on average NZ$2.4 million a day. There are approximately 540,000 international visitors each year, who spend 3.7 million nights and NZ$436 million. The largest international visitor market is Australia, with over 210,000 visitors spending approximately NZ$334 million annually..
Wellington is marketed as the 'coolest little capital in the world' by Positively Wellington Tourism, an award-winning regional tourism organisation set up as a council controlled organisation by Wellington City Council in 1997. The organisation’s council funding comes through the Downtown Levy commercial rate. In the decade to 2010, the city saw growth of over 60% in commercial guest nights. It has been promoted through a variety of campaigns and taglines, starting with the iconic Absolutely Positively Wellington advertisements. The long-term domestic marketing strategy was a finalist in the 2011 CAANZ Media Awards. 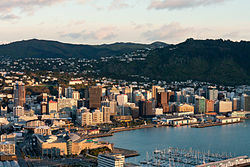 Popular tourist attractions include Museum of Wellington City & Sea, Wellington Zoo, Zealandia and Wellington Cable Car. Cruise tourism is experiencing a major boom in line with nationwide development. The 2010/11 season saw 125,000 passengers and crew visit on 60 liners. There were 80 vessels booked for visits in the 2011/12 season – estimated to inject more than NZ$31 million into the economy and representing a 74% increase in the space of two years. Wellington is a popular conference tourism destination due to its compact nature, cultural attractions, award-winning restaurants and access to government agencies. In the year ending March 2011, there were 6495 conference events involving nearly 800,000 delegate days; this injected approximately NZ$100 million into the economy. Wellington showcases a variety of architectural styles from the past 150 years – 19th-century wooden cottages, such as the Italianate Katherine Mansfield Birthplace in Thorndon; streamlined Art Deco structures such as the old Wellington Free Ambulance headquarters, the Central Fire Station, Fountain Court Apartments, the City Gallery, and the former Post and Telegraph Building; and the curves and vibrant colours of post-modern architecture in the CBD. The oldest building is the 1858 Colonial Cottage in Mount Cook. The tallest building is the Majestic Centre on Willis Street at 116 metres high, he second tallest being the structural expressionist State Insurance Building at 103 metres. .For a full list see: List of tallest buildings in Wellington. Futuna Chapel in Karori was the first bicultural building in New Zealand, and is considered one of the most significant New Zealand buildings of the 20th century. Old St Paul's is an example of 19th-century Gothic Revival architecture adapted to colonial conditions and materials, as is St Mary of the Angels. Sacred Heart Cathedral is a Palladian Revival Basilica with thePortico of a Roman or Greek temple. The Museum of Wellington City & Sea in the Bond Store is in theSecond French Empire style, and the Wellington Harbour Board Wharf Office Building is in a late English Classical style. There are several restored theatre buildings: the St James Theatre, the Opera House and the Embassy Theatre.